If you make consumer electronics and household appliances, function isn’t enough: Aesthetics are a top priority, too. When a leading home appliance manufacturer recently tested shelves for a new line of refrigerators, the company ran into a glitch: The die-cast metal frames for the glass shelves were susceptible to corrosion. So Mar-Bal Inc., a compounder and molder of thermoset composite products based in Chagrin Falls, Ohio, worked with the appliance manufacturer to design and test an alternative. Mar-Bal supplied more than one million shelf frames made from THERMITAL™, a thermoset composite with a physical vapor deposition (PVD) finish that resembles metal. Mar-Bal provides thermoset composite components for several consumer appliance brands, including Whirlpool, Maytag, KitchenAid, GE and Electrolux. “You can find a Mar-Bal manufactured component in anything in the kitchen or laundry room of a home,” says Marc Imbrogno, director of materials engineering for Mar-Bal. The company makes components that consumers see and touch every day, such as appliance handles, knobs, control panels, consoles and vent trim. Composites make sense for household appliances for obvious reasons: They offer durability, low thermal conductivity and corrosion and chemical resistance. But appliances are just one area within the larger consumer products market where composites are gaining traction. Consumer products encompass anything that people buy for personal or household use, from necessities such as clothing to luxury items like boats and sports equipment. In addition to household appliances, composites are poised to take off in the consumer electronics marketplace, where early adopters are testing and beginning to introduce handheld devices, mobile phones, laptop computers and tablets comprising composite materials. The main reason that consumer product manufacturers are turning to composites is for durability and lightweighting, says Mathur. But they’re also looking for the “oomph” factor, he adds. People want appliances and electronic devices that feel good to the touch and look stylish. “That’s a challenging role for any composite to fulfill,” admits Mathur. He says that long-fiber reinforced thermoplastics form a skeletal network that increases the structure of the part, giving it the requisite stiffness. PlastiComp utilized carbon fiber because it’s electrically conductive, which in turn meets the need for EMI shielding. The company hit targets for surface resistivity through the use of specific additives and nanofillers it declined to disclose. It’s important to note that while PlastiComp is primarily a materials supplier, it did not provide any of its LFT composite compounds to the consumer electronics manufacturer. “We were paid simply to do development work,” says Eric Wollan, business development manager for PlastiComp. “We told them how to produce the brackets, and they took that knowledge back internally.” And that’s OK with PlastiComp and other companies trying to help composites gain a foothold in the market. “Right now, the composites industry – the materials suppliers, processing companies and equipment manufacturers – are going through the very painful education phase for the early adopters,” says Halford. Surface Generation is working hand-in-hand with customers on a few projects, including laptop computers and tablets. Though the company is tight-lipped about the details, Halford shared some of the big-picture challenges. Even though composites usage in household appliances is not new, customer education remains a priority in that niche, too. Mar-Bal holds “knowledge share events,” bringing several employees to key accounts to position composites as a substitute material. The company spends a couple of hours with the client’s design engineers, product engineers, the quality team, purchasing staff and others. “The goal is to raise awareness of the benefits of composites because many people don’t really know what they are,” says Poff. These knowledge share events are the prelude to solid partnerships with customers. It’s important to get in on the ground floor and offer advice on design and processes. “Our job is to interface with the customer – to understand their needs – then balance that with the capabilities of thermoset composite materials and processes,” says Imbrogno. For example, by being involved early Mar-Bal can inform a client if a surface or geometry can’t be molded reliably or if a unique color or look requires post-mold finishing. The pressure to produce complex appliances and electronics that must look great and feel good is compounded by the urgency within the industry to churn out newer, better items at breakneck speed. “It’s so different from aerospace or automotive,” says Halford. “You talk to an auto guy who says they need something quickly, and you just smile and say, ‘Yes, of course.’ But that’s not quickly. The consumer electronics world will redefine your understanding of scale and speed. Mathur of PlastiComp concurs. Their customers demand short development cycles – typically eight months or less depending on the complexity of the part and how long it takes to make the tool. The development cycle for the mobile phone bracket was only four months. That’s a rigorous schedule for one company, which is why Halford of Surface Generation says partnering is paramount to future success in the marketplace. “To work on something new, you must collaborate, even if you are competitors,” he says. “Consumer electronics companies will not single-source from a supplier, so I need my peer group to be successful. We need three or four viable material suppliers, processing suppliers and molding houses out there who are credible to ignite the touchpaper.” With a capable supply chain working together and generating excitement in the marketplace, products will follow. Halford says big players in the consumer electronics industry will release an initial wave of composite-based products this year. Then those companies and followers will work out the kinks inevitable in new products and market second-generation products throughout 2016. Halford expects thermoplastic consumer electronics “will settle down into normalcy” by 2017. 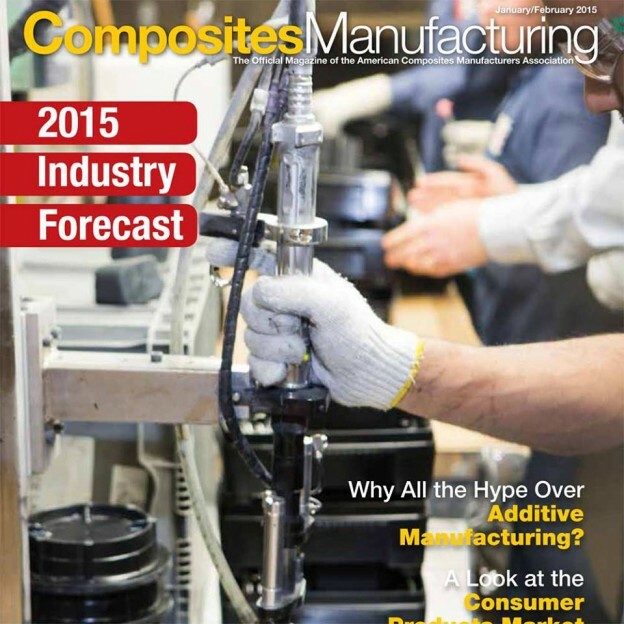 Composites Manufacturing Magazine. Article: Giving People What they Want. Retrieved from http://compositesmanufacturingmagazine.com/2015/01/composites-give-people-the-form-and-function-they-want/ on June 21, 2015. This entry was posted in News and tagged appliances, composites, consumers, injection, manufacturing, molding, thermoset on January 1, 2015 by Ron Poff.